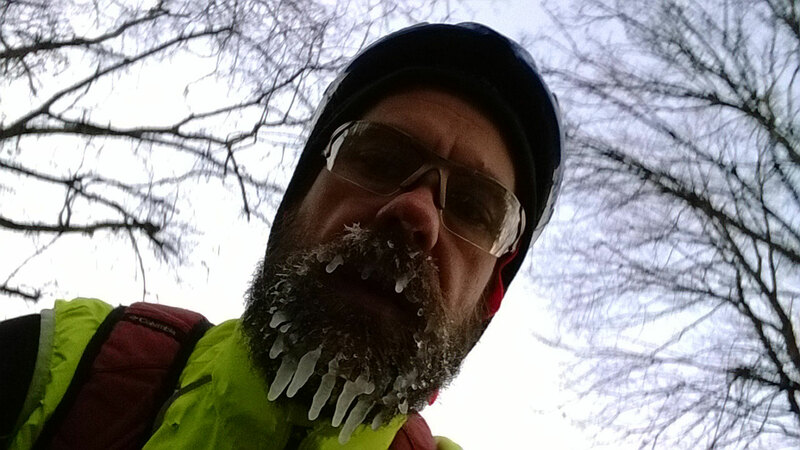 I took this picture of my frozen beard about 3 hours into my attempt to ride from Nashville home to Birmingham. I was actually quite warm except for my feet, which were very, very cold. Everything was fitting together perfectly for me to attempt this epic ride from Nashville, TN back home to Birmingham, AL. 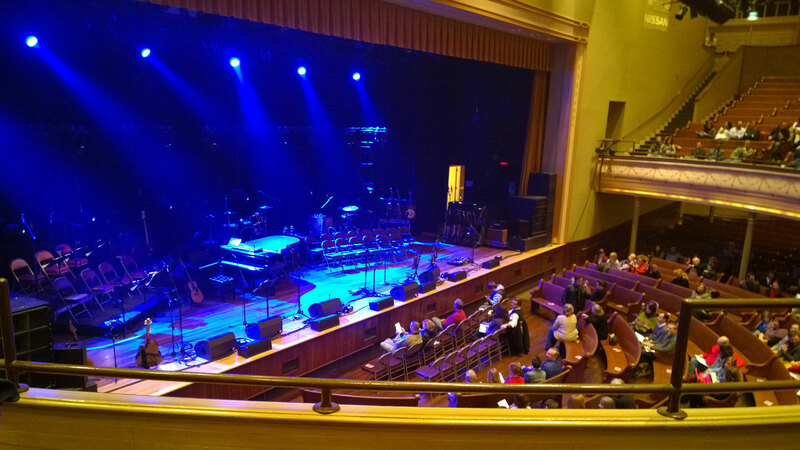 Kristine and I had tickets to see Andrew Peterson’s “Behold the Lamb” Christmas concert at the Ryman Auditorium in Nashville. We had a fun date night together and with my cousins Richard and Christy who live in Franklin. After the concert we hung out with our friends who had also driven up from Birmingham from the concert. By the time Kristine and I had made it back to our hotel, and by the time I got everything ready for my early departure in the morning it was 12:30AM. I toyed briefly with the idea of just starting my ride home right then rather than sleeping at all, but there were still a lot of cars on the road at midnight when we were driving to the hotel. I felt it was safer to let the streets clear out completely before departing so I ended up setting the alarm for 3:30AM to get exactly three hours of sleep. I was wide awake when the alarm went off, but despite having tried to get as much stuff together as possible before sleeping, it took me 30 minutes to get all my clothes on, eat, and get out the door at nearly exactly 4AM on what I was hoping would be a 14.5 hour, 250 mile ride home to Birmingham. Annotated temperature graph pretty much tells the story of the ride. I knew it was going to be cold for an extended period of time, but I was imagining temps closer to 20 degF than 10 degF! Even with the crazy temps (see the temperature graphs above), I was doing just fine everywhere except for my feet. I had thick insulated neoprene booties on, but even with loose shoes and as much blood circulation as possible, my feet just couldn’t stay warm. I had meant to grab some of the chemical warming packs to throw in my shoes but I had forgotten them at home, and I figured most gas stations in Tennessee are not going to carry them. If I had been in Wisconsin, I could have stopped at the next gas station and bought a couple of the chemical warmers for a dollar or two and been on my merry way. Following the old standby rule – “if you are cold, just ride harder”. Riding hard while standing and focusing on pulling my feet up rather than pushing them down – forces more blood down into your feet, the more inefficient and erratic the movement the better. Riding downhill with the brakes on while still pedaling hard – anything to minimize windchill and maximize blood circulation. Adding in as many steep hills as I could find – benefit of reducing windchill and increasing heartrate. Even with all of those tricks, I was seriously contemplating calling Kristine to meet me in Lewisburg and abandon the ride after only 70 miles or so. But not too long after the sunrise, temps started to rise pretty rapidly all the way to the 20s by Lewisburg. The best thing was stumbling upon the donut shop with a heater I stood in front of for nearly an hour while drinking coffee and trying to warm up. 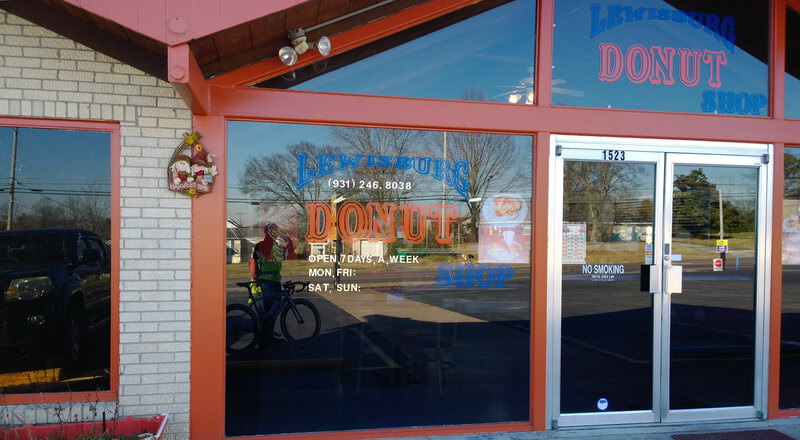 Lewisburg donut shop – I spent an hour in here warming up after four hours of riding in the cold. I had ridden in Lewisburg earlier this year, so I left the donut shop warmed up and on familiar roads. I made some great time between here and Fayetteville with some good climbs, warming temps, and a stiff north wind (tailwind). It was funny to be so cold before the donut shop and then to be sweating on a lot of the steep hills just a couple hours later. The section of US-64 was nice, but stressful even with a huge clean shoulder to ride on. On top of being stressfull, it was rather boring with very few turns and lots of long gradual climbs and descents. I struggled with “sleepy fatigue” through here as I was also probably crashing a bit from the caffeine and sugar from the donut shop. I turned in Fayetteville and headed due south on a section of US-231 that was terrible with a very narrow shoulder and a lot of traffic. Fortunately, I turned off of it after a few miles and found some more beautiful backroads that gradually flattened until they were basically pancake flat by the time I hit the Alabama border. I had also ridden some of these roads once before so it was encouraging to be making great time and to be on somewhat familiar roads. Unfortunately, my math brain was doing a lot of calculating through here and I had worked out a 10:30PM arrival in Birmingham at my current pace. This was somewhat discouraging as that was FOUR HOURS longer than I had planned. Kristine wanted to pick me up in Cullman, but I convinced her to let me ride to Cahaba Cycles Trussville, which would knock an hour and a half off the ride all the way back to our house in Hoover. That was the plan when I stopped at a waffle house off of US-72. Rejuvenated, I blazed through Huntsville at a decent clip but managed to hit a lot of school traffic and then by the time I made it all the way down to the Tennessee River bridge, I was picking up some early rush hour traffic. The road was really dangerous with stretches of nice shoulder followed inexplicably by long quarter mile sections of road with ZERO shoulder. The white line was right up against the grass. I spent a few miles trying to time the packs of cars coming up behind me (based on the traffic light before the bridge) perfectly with the shoulder. No close calls but I did bail off the road into the grass a couple of times when I didn’t get my timing right. I just did not trust the eighteen wheelers and the people driving 65+ mph. Definitely the most dangerous stretch of road for the trip and probably one of the top dangerous roads in Alabama in my opinion. (And I have ridden a LOT of roads in Alabama). The climb itself was a good one with a nice fairly clean shoulder somewhat akin to the US-280 climb from Lee Branch heading east towards Chelsea for those of you in Birmingham who may have done that climb – except the US-231 climb is a bit steeper climbing an extra 150 feet compared to the US-280 climb. I turned at the top onto Apple Grove road and followed this forever … eventually hitting this year’s Alabama state road race course overlapping with it from the four way stop at the church all the way down past the steep descent. Instead of following the race course, I continued on through the descent and up the next hill continuing on this road for quite a while. There was one super steep cat 4 climb http://app.strava.com/activities/99939588#2138520004 that I was really thankful for after a stretch of flat roads. 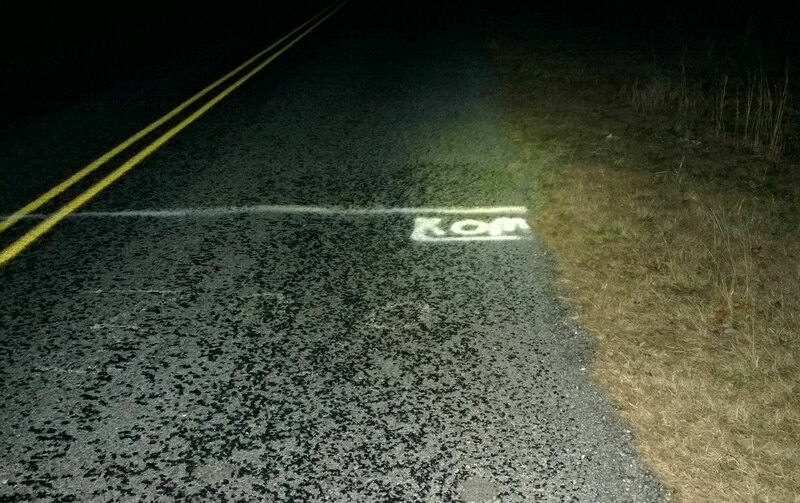 It had a section that was 0.3 miles long at 13% – I hit this at about 175 miles into my ride after sunset but before it got too dark to see without my light. At the top of this section, I decided to call Kristine and move up the “pick-up” spot from Cahaba Cycles Trussville to the bottom of Skyball. I was getting cold, the dogs were getting bad, and my recalculations had me arriving in Trussville closer to midnight as my pace started to slow. This was the worst stretch of road as far as dogs went. It was one dog or group of dogs chasing me at what seemed like every house / trailer along the next set of county roads. I knew there would be some small roads and lots of potential dog problems along the entire route, but it really was just the county roads in southern Morgan County and Cullman County that were full of unchained, unfenced dogs. I tried being friendly with the dogs and most of them were fine, but then it started to get annoying. 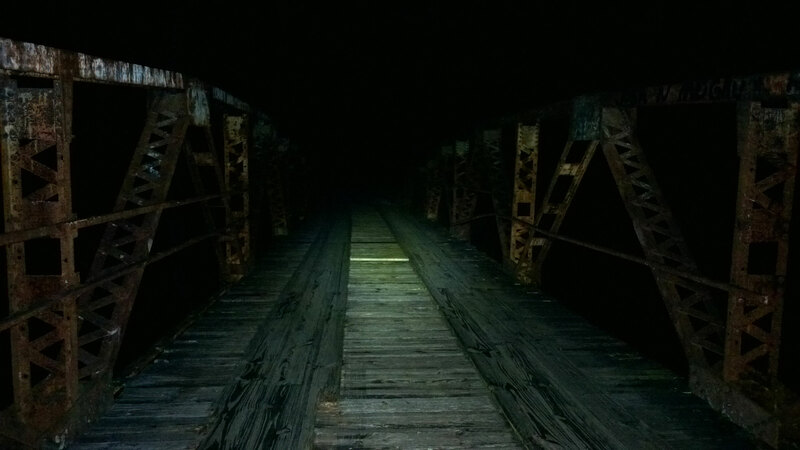 Fortunately, it was dark by this point and I kept my light on high-beam to blind the dogs. This was pretty effective as shining my light in the dogs’ eyes would without fail stop the dog dead in its track. My only guess is that the light is bright enough to temporarily blind/hurt/scare the dogs. Passing east of Cullman I bee-lined it for the Tour de Cullman route arriving at this familiar bridge. I climbed sky ball at a snail’s pace, but I knew Kristine was waiting for me at the other side of the hill. Even though I was really disappointed not to make it all the way home, I was very happy to have climbed sky ball. At the top as I was taking pictures, my light died! Fortunately, there was a full moon so I’m 45% sure I could have ridden the rest of the way home in the dark as I ended up descending Skyball with no light at close to 30mph. That’s how bright the moon was! Still, I’m thankful that the light died as it gave me another great excuse to hop right in the car when I found Kristine at the blinky light intersection where I had directed her to meet me. What an adventure! Next time I’m going to make it!! Here’s all the pictures that I took during the ride. Holy crap, that’s cold! 14.7 degF – that was the first time I had looked at the temp – little did I know it was heading down to 10.9 degF before sunrise and going to get stuck there for at least an hour! About 3 hours into my attempt to ride from Nashville home to Birmingham, I took this picture while riding of my frozen beard. I was actually quite warm except for my feet. It’s only 15 degF outside, how about a frozen slushy to warm your insides right up! Tour de Cullman wooden plank bridge that marks the start of the hard part of the ride. I reset my Garmin splitting the ride into two files, but I left my iBike as one file – hence the 209.3 mile distance. Also, the iBike autopauses every time you stop which is why it is showing 13 hours instead of the 15 hours wall clock time. Analise and Josiah were working on homework and playing games while they waited in the car with Kristine at the bottom of Skyball mountain. This entry was posted in Adventure, Training and tagged cold, epic, raam, snow on December 15, 2013 by kartoone.